On October 23, members of the University of Redlands community gathered for the fifth annual faculty technology grant showcase. Initiated by President Ralph Kuncl and funded by the Provost’s Office, the faculty technology grant program promotes faculty members’ innovation in learning and teaching. Over the past five years, nearly $80,000 has been awarded. This year, 11 professors worked on nine projects ranging from utilizing QR codes to exploring online learning techniques. At the gathering, presenters illustrated their projects and reflected on the processes and results of their work. 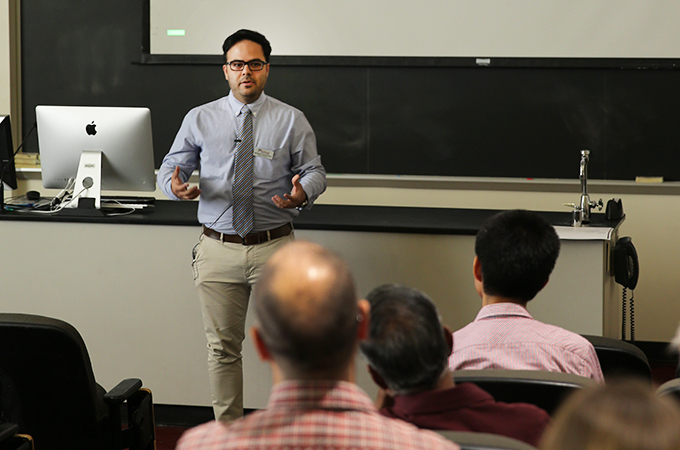 School of Business Professor Mehrdad Koohikamali explained how emotional attachments to physical places can be recorded with GIS data points to enhance students’ spatial learning and knowledge. Biology Professors Dustin VanOverbeke and James Blauth demonstrated how a multiyear project to collect information on various tree species across campus resulted in a tree map. Students from the professors’ botany, first-year seminar, ecology, and entomology courses collected data and affixed small plaques with QR codes to various trees. Passersby can scan the QR code using their smartphone cameras and learn information about a specific tree, including the species, whether it produces flowers or fruit, and the kinds of insects that interact with it. Professor and Clinic Director of the Truesdail Center for Communicative Disorders Julie Shuler explained how mobile apps and iPads can be used for graduate clinical training in communication sciences and disorders. After utilizing specific speech therapy apps in clinic sessions, communicative disorders graduate students reported they felt comfortable using these tools with their clients. Other professors expanded on the implementation of various online learning techniques. Professor of Choral Studies Nicholle Andrews developed online courses for music students to learn about body mapping. Renee Van Vechten, a professor of political science, transferred lecture content into short videos and quizzes for students to take outside of class in order to have more time for interactive activities and discussions in the classroom. Additional projects focused on using technology to prepare students for their careers. Collaboration between the School of Education’s Nicol Howard, Nirmla Flores, and Stephanie Quan resulted in a workshop for students to identify and address digital inequities in the classroom. Andres Luz, a professor in the School of Music, explained how sound art kits, including a microphone and other audio technology, are helping students prepare for careers in film and audio engineering. Learn more about U of R’s faculty technology grants and programs of study.